Mozzarella & Parmesan Cheese for toppings. Clean prawns thoroughly. Trim "whiskers" & cut away the claws. Slit open the prawns from the front & devein. Remove any dirt from the head. Smash the claws & remove some of the shells. Set aside for other purposes. Sautéed garlic till fragrant but not brown. This step is optional. You can skip it & leave it to the baking step, but I prefer my garlic to be nice & crisp. Massage prawns with butter & place on baking trays. Look at the amount of roes on the heads! Add garlic, then mozzarella cheese. Use toothpicks to keep the prawns open. Top with parmesan cheese & bake for 10 mins or till brown. 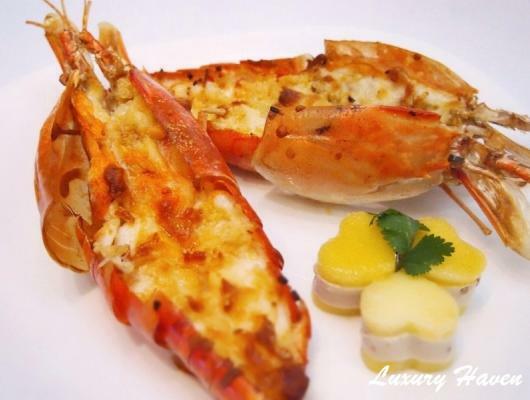 Remove toothpicks before serving & pair these Baked Cheesy Jumbo River Prawns with your favourite sides! I was thrilled to receive these monster delicacies, with sizes as big as my dinner plate! These came just in time for Valentine’s Day, which I’d prepared these succulent & delish Baked Cheesy Jumbo River Prawns, simply pairing them with some gourmet Walnut Cheese & Mango!